Ah sticky toffee pudding, possibly one of my favourite childhood desserts! A classic school dinner pud that always brightened the coldest, wettest school day. 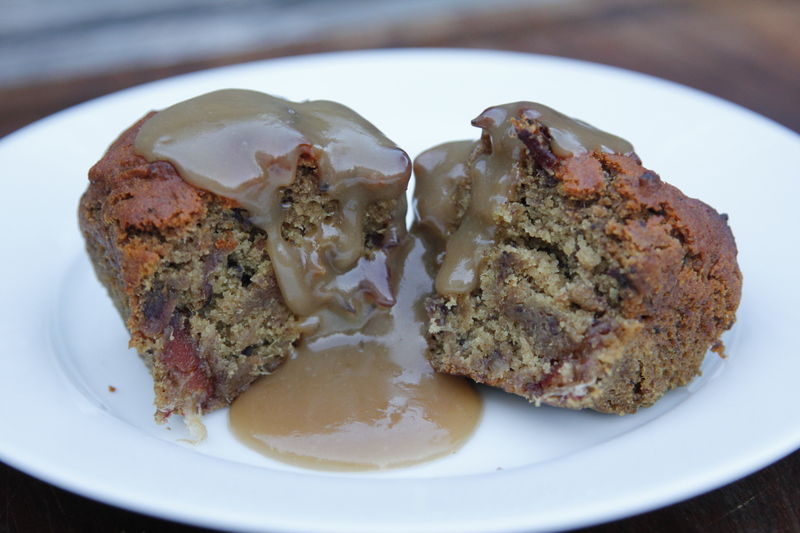 I’ve not had a sticky toffee pudding for years though, so when my favourite vegan, Mel, suggested I have a go at making one this weekend I jumped at the chance. This one’s perfect as a comfort pudding on a cold evening, served with some dairy free custard. It definitely needs to be served warm, and you definitely need the sauce with it – and lots of it! The pud itself is not over-sweet, if you’re looking for something sweeter you might want to use unrefined sugar instead of the agave. but once you pour the sauce over it I’m sure you’ll find it will satisy any sweet tooth. As a nice twist you can soak the dates in rooibos tea and make an earl grey caramel sauce (I’ll explain below!). If you don’t have the rice and quinoa flour you can substitute it for an all purpose plain gluten free flour mix (you also need to leave out the xantham gum if you do this), or if you just want to make it low gluten you can use white spelt flour (and again, leave out the xantham gum). Preheat the oven to 175 C and grease 5 – 6 small ramekins. 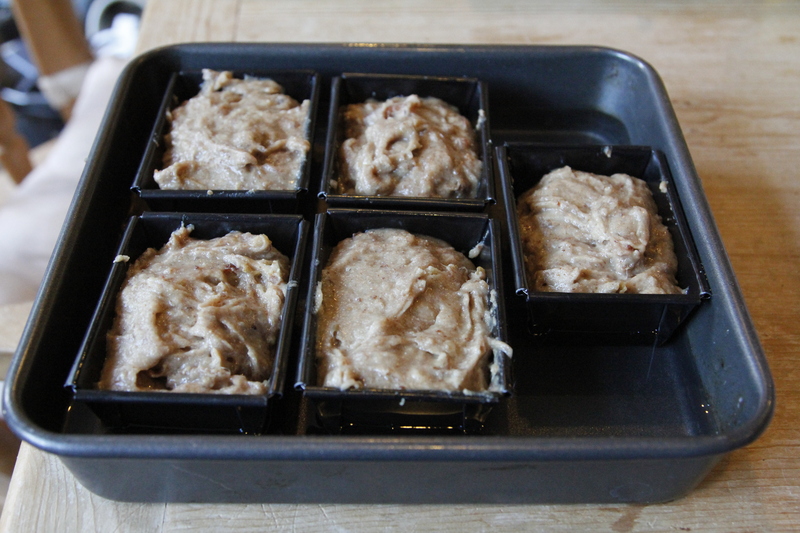 This recipe filled 5 of these mini loaf tins (which are brilliant by the way!) but you could use a larger tin and create one big pud! Put the dates and water/tea in a small pan and simmer for 5 mins. Then let it sit for 15 mins until the dates are nice and soft. Meanwhile sieve all the dry ingredients (except the bicarbonate of soda) into a bowl. Put the coconut oil, agave, date syrup, vanilla and flax mix in another bowl and mix until well combined. Once the dates are soft add in the bicarobonate of soda and let it foam. Then lightly mash the dates before adding to the wet ingredients. Mix it all together and add in the dry ingredients and combine well. Pour into the greased tins. Place the tins in a bain-marie – I used a roasting tin with enough water in to go up to half the height of the load tins. Bake for 30 – 40 mins until a skewer comes out clean. Keep an eye on the puds – if they start to get too brown on top then lightly place a sheet of tin foil over them to prevent burning. Remove from the oven and allow to cool in the tins for 5 mins before transferring to a wire rack. Now for the sauce! If you want to go for an earl grey (or any flavoured tea) sauce then you need to infuse the coconut or soya milk with the tea first. Put the milk in a small pan on the hob, add 1 tbsp of loose tea or 2 tea bags and gently warm it. Do not let it simmer or boil. Let is sit for a good 15 mins, then strain it for use. To make the sauce melt the coconut oil in a small pan over a low heat. Whisk in the sugar, stirring continuously until it dissolves (approx 3 – 4 mins). You may find it won’t completely dissolve – don’t worry about this, it will still work. Ad the milk a little at a time. When you first add it it will spit and fiz and you’ll panic like I did and think you’ve mucked it up! Just stir quickly and then add the rest in one go, stirring all the time. You’ll find this will instantly create a smooth sauce. At this point keep stirring to combine the oil (it does tend to want to separate out). If you like your sauce runny leave it as it is, but if you want something thicker then add the cornflour/arrowroot mix – stirring continuously whilst still on the heat. Stir until it thickens and then remove from the heat and pour into a jug for serving. This entry was posted in cakes, comfort pudding, dairy free, gluten free, low gluten, vegan, winter puddings and tagged a cake recipe, baking, bread pudding, cake recipe, cake recipes, comfort food, dairy free, dessert, dessert recipes, desserts, easy recipes, gluten free, healthy snack, pudding recipe, pudding recipes, rice pudding, sticky pudding, toffee, toffee pudding, toffee recipe, vegan, vegan recipes, vegetarian, vegetarian recipes by Dr Nancy P. Bookmark the permalink. Looks good and I cannot wait to try.